A number of polls trickled in throughout the afternoon Monday, setting some pre-debate baselines before the campaign hits the stretch run. In all, there were 17 new surveys from 10 states, and there was a lot of new data from Ohio and Pennsylvania through which to sift. It has been two weeks since Rasmussen was last in the field in Colorado and things have shifted toward Romney in that time. The governor gained a couple of points and the president lost three. However, that probably masks the true state of the race in the Centennial state. Have things moved toward Romney? Some, yes, but not perhaps as much as the poll-over-poll comparison from Rasmussen would lead you to believe. Compared to the FHQ weighted average, the Obama share of support in the poll is in the ballpark, but the Romney share is overstated relative to the other post-debate (Denver) polling. In fact, the raw average of post-debate survey work in Colorado shows a virtual tie (a one-tenth of a point Romney lead). This poll isn't "wrong" but it is on the (Romney) end of the range of polling in the state. The PPP survey last Thursday was on the other (Obama) end of that range. FHQ will take a similar tack in Florida where the range of polling margins appears to be in the Obama +1 to Romney +5 range at the moment. Angus-Reid's first survey in the field in the Sunshine state comes down on the very (Romney) end of that range, but it is a result that is consistent with the established order of states. Florida is more in Romney's direction than the Ohio poll from the firm yesterday and the Ohio poll is more toward the middle than the Michigan poll from yesterday as well. 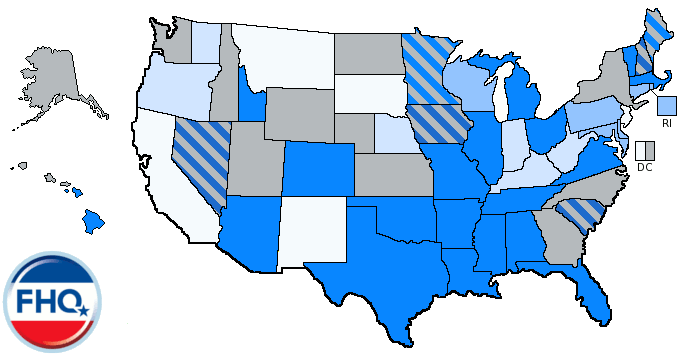 [The order holds when the surveys from Pennsylvania and Wisconsin are added too. But I'll get to those shortly.] This is a long way of saying that this poll is par for the course. Florida may be ever so slightly tipped toward the president in the FHQ weighted averages, but that is gradually changing. Remember that the averages are rather conservative and when a change occurs -- if one occurs -- it is usually a lasting change. Kimball Political Consulting last conducted a survey in the Bay state in early September and that poll showed the same 55-39 advantage that the newly released October poll indicates. In a Strong Obama state with little or no electoral suspense (at the presidential level anyway), that's a talking point, but that's about it. Tied, Romney +4, Tied, Obama +1, Romney +1, Obama +9. Those are the post-Denver margins in the Granite state. Which one doesn't go with the others? Well, I suppose a case could be made for the Romney +4 or the Obama +9, but I'll let the ARG poll slide for the moment. It isn't nearly as off as the UNH poll released today seemingly is. FHQ will leave it there. The Pulse survey was conducted on the eve of the second presidential debate, and a week afterward, it is probably somewhat dated. That said, along with the other two polls, the FHQ weighted average for Ohio continues to slowly track downward. And while that may be the case, both it (Obama +3.1) and the raw, post-debate average (Obama +1.6) continue to favor the president. There are two views of this: either it is the type of narrowing that is typical of late polling as undecideds come off the board or there is some real movement toward Romney. The reality is somewhere in between as there has definitely been some post-debate movement toward Romney, but it is running just a bit above the normal narrowing that we usually see in a non-2008 general election. The point here is that there is an established range of polling data in the Buckeye state that runs from tied to about a three point lead for the president. But the more data we get on that Romney end of the range, the closer that is to reflecting the reality. The four new additions from Pennsylvania today are kind of all over the map, but the average margin across the quartet of polls is Obama +5.5. That is more indicative of things in the Keystone state than if we tried to take each of the four one-by-one. The truth is that Pennsylvania is a lot like another state that is near it in the averages, Michigan. And as we indicated with Michigan a day ago, Obama is in a good position; hovering in Pennsylvania around the 49% mark in both the FHQ weighted average share of polling support and the raw, post-debate average. Now, that is not an unbeatable position, but it is a tough one overcome from the Romney campaign perspective; especially given Romney's averages. Nearly all of the remaining undecideds would have to break in the governor's direction on election day for him to even come into range in either Michigan or Pennsylvania. The meme in Virginia around FHQ the last few days has been the way that Obama and Romney have traded leads in the polls there of late. That is again the case among the pair of polls released today. And as we said yesterday, that has muted the impact on the averages. The trajectory has been ever so slightly toward Romney but it is not a very steep decline in the averages. Virginia is in that tier of states with Colorado and Florida that has moved within range for Romney in the FHQ weighted average, but has yet to actually jump the partisan line into the Toss Up Romney category. There is not much of a story in Washington. The Strategies 360 survey of the Evergreen state is right on the FHQ weighted average of polling in the state. That isn't a recipe for change in a state that hasn't really budged from the Strong Obama category throughout 2012. Both the Angus-Reid and Pulse surveys of the Badger state are consistent with the ordering of other states in which they were both also in the field. Wisconsin is somewhere on the Obama side of Ohio at this point. The range of polling isn't as important in Wisconsin right now as Obama's relative position to 50% there. The margin can be very close indeed, but if the president is consistently either at or hovering around that threshold, then it really doesn't matter where Romney is in the polls by comparison. If there is a reason Romney has mostly steered clear of the Badger state recently, this is it. Wisconsin is one of those close but not quite sorts of states given the information we have now. There are a couple of points that FHQ would like to drive home today. 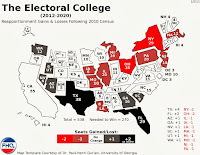 First, consistent with the way things have been around these parts for quite a while now, the map and underlying electoral vote tally are unchanged today. 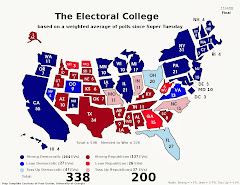 That is also true where it matters most on the Electoral College Spectrum below. But secondly, note also the language that kept recurring above: the Romney end of the range. President Obama continues to hold smaller, but consistent leads in the surveys conducted in most of the toss up states. 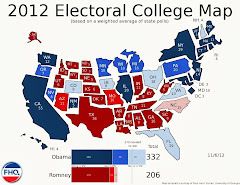 However, there are seemingly more and more polls that are occurring on the Romney end of the range of polls. Now, that end could still be tied as it is in, say, Iowa or Ohio or favoring Romney as in Colorado or Florida. In other words, there is some variation. Yet, to the extent the Romney end of the range sorts of polls continue to pop up, the averages will continue to compress. The question posed by FHQ above is important, though. Is that normal late-game narrowing in the polls or is that plus continued movement toward Romney? The slow, incremental change leads FHQ to the conclusion that it is likely more the former than the latter, but there are still two weeks to go in this thing. Note that we mentioned that there were no changes to the Spectrum where it matters most -- the middle, most competitive column -- but there was a change on the periphery. Massachusetts and Illinois swapped places in the left-most, Obama column. Though the Watch List remained unchanged as well, it is worth commenting on just how close Ohio is to dropping off the list now. The FHQ weighted average for the Buckeye state sits at 3.08 at the moment. If the polls keep coming in on the Romney end of the range, Ohio will slide more firmly into the Toss Up Obama category.